It wasn’t enough that the Mets lost their third straight game last night — they lost ANOTHER outfielder to injury. 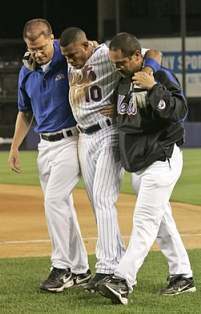 Endy Chavez pulled his hamstring while trying to beat out an infield grounder in the seventh inning, making him the seventh outfielder in the organization to go lame this year (the others: Ben Johnson, Lastings Milledge, Carlos Beltran, Shawn Green, Moises Alou, and for a moment, Carlos Gomez). Oh, and if you count Damion Easley as an outfielder — he did start in leftfield a week ago — then you can make it nine. Easley missed last night’s game due to tendonitis in his knee. Luckily, Jose Valentin is ready to return — he hit a three-run homer in a rehab start with Port St. Lucie on Tuesday — and will likely be added to the roster today or tomorrow, with Chavez going to the DL (pending an MRI). Also, Shawn Green should be coming off the DL this weekend — in fact, he may have never needed to go on in the first place, if you hear him tell it. When Moises Alou returns, however, is another story. Assuming that Valentin and Green come back by the weekend, the injury to Chavez shouldn’t be too devastating. Valentin, hopefully, can step right back in at second base, and free Damion Easley to make spot starts both at the keystone and in leftfield. Or, the Mets could give Ruben Gotay more time at second and put Valentin in leftfield, if necessary. A corner outfield position would presumably place less stress on Valentin’s knee than playing second base — where he’d have to make more sudden, and sometimes jarring movements in going after ground balls and turning DPs. How the Chavez injury affects Carlos Gomez is another story. Does it make sense to demote the Mets’ fastest, and second-best defensive outfielder, with all the question marks and aging veterans currently patrolling the pastures beyond the infield? Personally, I’m a fan of Ben Johnson, but he hasn’t done much in his limited audition to warrant an extended stay. Gomez, on the other hand, has been brilliant in the field, and though he’s still way too free-swinging, his speed is an asset and he has hit the ball hard (when he makes contact). The Mets would prefer to send Gomez down to play every day, but with Endy out, he’s the ideal replacement. Or, the Mets could send Ruben Gotay down — which would be a disgrace, but the more likely scenario. With Valentin, Easley, and David Newhan, the Mets already have three 2Bs (yes, Newhan plays the infield, but don’t tell Willie!) — carrying a fourth makes little sense when there are so many issues in the outfield. It’s too bad Gotay didn’t get more of a chance to play; we might have found out whether the second baseman of the future was inside the organization or not. How ’bout Todd Walker? Ain’t he available? Or Steve Finley? Yeah, I realize that signing Finley would bring the average age of the Mets way up, but it couldn’t burt. I’d love Walker, but the Mets probably don’t need another second baseman (they count Easley as one, remember). Finley fits right in as an AARP-card-carrying member. Rremeber, Joe–it’s a “short-term solution.” All I’m looking at is the next 30 days or so. Hey I’m on your side. You already have read my opinions on Walker, and I love the hard-nosed play of Finley.